Caravanserais are building and palace built as guest houses on trade routes. 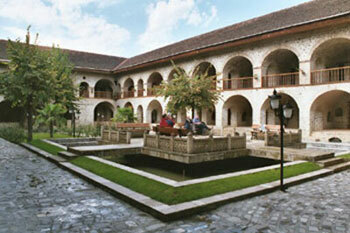 Caravans are kept at those buildings built by merchants, people gets relaxed and continue on their way. During the Middle Ages, the buildings built to protect the military and borders, and later buildings with trade purposes became used as caravanserais. In ancient times a large part of the trade routes crossed Azerbaijan, so it was necessary to construct caravanserais here. Except for caravanserais in the city of Baku (as today they are preserved in Old City as historical and architectural monuments), traces of caravanserais preserved till the Armenian occupation of Nagorno-Karabakh. These are those caravanserais having ancient and rich history. The most unique and historical caravanserais, considered as pearls, are still preserved in Old City. One of them is Bukhara caravanserai. According to research, this historical monument was built in the 15th century by merchants who came from Central Asia to Baku. As merchants from the Eastern countries were in the need for temporary shelters, so they used to have rest in this great caravanserai. The name of the building was taken from then capital of Uzbekistan, Bukhara. This is one-storey caravanserai. It is assumed that other floor of the caravanserai remained under the ground. The private nature of Bukhara caravanserai, which consists of 17 rooms, is a circular shape. Likewise in other eastern caravanserais the pool is located in the center of yard of this caravansary. The pool preserved as it is since XV century till date is of surprise and interest. Thus, although t the water flows from fountain but pool does not get full and the water remains at a certain level. Caravanserai walls are decorated with the pictures from ancient Azerbaijani carpets, kilims, decorations, pictures depicting Baku. The main purpose here is to form imagination on ancient and rich history of Azerbaijan at foreigners visiting the caravanserai. Multani caravanserai - one of the hundreds of caravanserais in Azerbaijan. Multanı caravanserai, which was related to fourteenth century although reached the twentieth century in destroyed conditions, but the monument has been restored in 1973-1974. The main construction material of the monument is small blocks and building stone, small, granular limestone of the used as traditionally in Shirvan-Absheron architecture school. The older ceiling of underground rooms was built from a complex mixture of lime, stone of the correct shape. The foundation of the building is the rock massif used in the natural shape. Gulustan Caravanserai is located in Julfa region, on the left bank of the river of Gulustan village. In 1974, the ruins of Gulustan caravanserai were found during the field survey, in 1978, the building plan was fully revealed. While building Baku-Julfa railway line (1939-1940) about half of the caravanserai was destroyed. At the result of studies, the Gulustan Caravanserai has been identified as the most famous and magnificent monuments among road caravanserais of Azerbaijan. 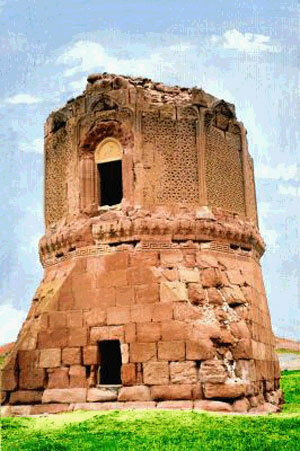 The same type of Gulustan caravanserai with total length of 37 m. was saved entirely on the right bank of the river. The location of the two caravanserais on the banks of the river face to face shows that before the bridge over the river was built, the river ferry operated here and the period of construction of caravanserais relates to beginning of the 13th century. Caravanserais were built of river stones and plastered with mud along. In the revealed part of the Gulustan caravanserai many living rooms were found. The largest caravanserai of Garabagh is is caravanserai in Garghabazar village of Fuzuli region. In ancient times, caravanserais are used widely as the means of regulating interstate commerce for the purpose of communication. In other words, changes in the nature and society of the near and distant towns were studied first of all. Caravanserai in Garghabazar village, a memory of XVII century, reached our era, is from such type. Ugurlu bey caravanserai was built in the early XVII century by architect Sheikh Bahaddin Mohammed Amil. The clay-lime mixture and egg whites, red bricks were used in the construction of the building. At present, the building is located in Ganja, Ali bey Huseynzade street. Selim caravanserai is a caravanserai at Selim Mountain, pass Alayaz area Keshishkend of Daralayaz town, the top of the village Agkand. Semicircular inscription on rock at the entrance door of the caravanserai prove that the caravanserai was built in 1329 by Abu Said Bahadur Khan, the ruler of the state of Elkhanids. If we add to this the fact that in Agkand village where the caravanserai was located only Azerbaijanis lived in this area until 1918, but the Armenians resettled and lived in the village (172 people, according to official statistics) in 1923-1925, and then it was impossible to deny the truth that the monument belongs to Azerbaijanis. But, unfortunately, Armenians deny the historical truth. 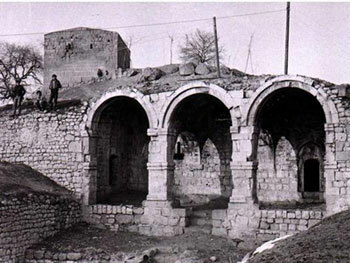 After forcible withdrawal of Azerbaijani from these areas in 1988, the government of Armenia totally falsified the facts related to Selim caravanserai and presented it to world as a monument of the Armenian community. From 5 large caravanserais existed in Sheki in XVIII-XIX centuries up today, only two of them Yukhary and Ashagy Caravanserai reached. Sheki Caravanserai like others was made for stay of travelers and caravans and was built according to the nature of its function. However, in contrast to the rest rooms along the way, along with the rest rooms special private rooms made for having various trading operations, to conclude barter agreements. 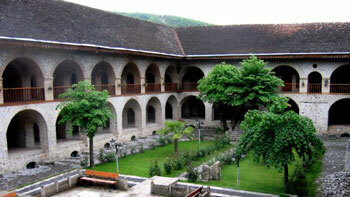 The caravanserai describes Sheki architecture on its plan structure, large size, the comfort of leisure and business. During the construction of the caravanserai everything is taken into account for providing convenience of traders from distant countries, for the safety of their wealth. Although the gates are opened for passengers and merchants with hospitality, but when closed it turns invincible castle.